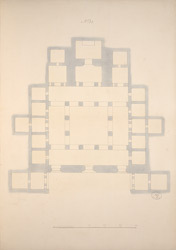 Pen-and-ink and wash drawing of the ground plan of Cave 21 from an album of 26 ground plans of the Ajanta caves and 16 folios of drawings of sculpture and architectural details in the Ajanta caves, by Capt. R. Gill, dated c.1850. excavated between the second - first centuries BC; then, after a period of more than six centuries, the excavations restarted around the fifth century AD, under the Vakataka patronage. Cave 21 is a monastery from the late fifth century. It has a verandah supported by richly ornamented columns flanked by side shrines. The roof of the hall is supported by twelve massive pillars. These have capitals ornamented with kings and queens, flying figures and stupas. The hall has preserved some traces of the paintings that used to cover its walls. The shrine houses a carved figure of Buddha. Around the cave there are fourteen cells.